Finding and keeping good public education administrators is a problem throughout the country, and research by a recent Sam Houston State University graduate provides some insight into the situation. Trampas Bass, who received his Doctorate of Educational Leadership (Ed. D.) in December, is now an assistant principal at the Hudson school district near Lufkin. 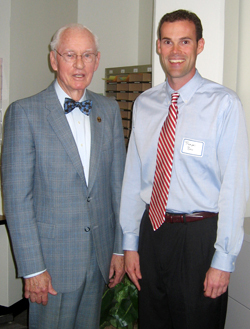 His research earned him the 2004 Jack Staggs Dissertation Award. Bass's study investigated why some educators seek positions as school principals and some do not. He surveyed professors of principal preparation programs as well as students participating in graduate-level educational administration courses. "The professor and student groups agreed on both questions," said Bass. The most important motivating factors to entering the principalship were the desire to make a difference, the opportunity to positively impact students and people, the personal challenge, the ability of the principal to initiate change, the professional challenge of the job, increased salary and benefits, and the opportunity to be a teacher of teachers. On the negative side, Bass found that increased stress, increased time commitment, pressures from standardized test scores, family responsibilities, and excessive paperwork were the leading barriers to entering the principalship. Approximately 66 principal preparation professors and 860 students participating in education administration courses representing 52 University Council for Educational Administration institutions across the nation participated in the study. Professor emeritus Jack Staggs, who taught in the educational leadership department and also served as dean of the College of Education and Applied Sciences, presented Bass with the award at a reception in the College of Education Teacher Education Center. "Years ago when we started this program, I decided I should set up a fund to recognize the individual who submits the best dissertation in a calendar year," Staggs said. The award is given every year to the author of the dissertation that has been most successfully defended, according to Theodore Creighton, professor and director for the Center for Research and Doctoral Studies in Educational Leadership. "I was very surprised, honored, and grateful to have received the Jack Staggs Dissertation Award," said Bass, who is originally from Chapel Hill and who received an associate degree from Tyler Junior College in 1991 and his bachelor's (1993) and master's (1997) from Stephen F. Austin State University. "I could not have produced a dissertation of Jack Staggs Award quality without the expertise and guidance of my committee chair, Dr. Theodore Creighton who is a professor within SHSU Center for Research and Doctoral Studies in Educational Leadership. I also had a lot of support from the rest of my committee: Dr. Mary Nichter, Dr. Stacey Edmonson, Dr. Carole Funk, and Dr. Charlene Crocker."